This beautiful object is a hallmarked sterling silver hair comb that belonged to our grandmother Mary Gallagher, nee Friel. (See earlier post here ) It was given to me by her second daughter, my aunt Eileen, in the 1980s. Aunt Eileen had very generously given, to the best of my recollection, one of her mother’s possessions – a watch, a ring, a pendant and a hair comb – to each of four granddaughters – Cathy, Nuala, Eva and myself. It never ceases to amaze me how few family artifacts pass down through the generations of ordinary people, but I am so honored and pleased to own this part of our family history. The hallmarks tell us that it was made by silversmiths, Reynolds & Westwood in Birmingham in 1905. But how did she come to have it? Who gave it to her? Was it a gift from her parents? Had it belonged to her mother? A gift from a beloved sister? From her husband, our grandfather? On the birth of one of her children? Or was it a possession that was handed on to her when one of her family passed away? The manufacture date is useful in that it can only be connected to her family members alive after that date. As she and our grandfather married in 1915, it is possible it was a gift from him – perhaps instead of an engagement ring? – but even that date is ten years after it was made. We will never know. We have three photographs of her. One taken at her marriage in 1915 and another after her first child was born in 1917. The watch, the ring, and the locket are clearly visible in these, but as the hair comb would have been worn at the back of her head, we don’t know if she was wearing it or not! It is in fact quite a serious ‘comb’ with long prongs that would have been inserted into wrapped up long hair to keep it neat. I have not seen one of these being worn, nor can I find any instructions on how to use it. It is however very beautiful. In days before hair bobbles and hairclips, they would have been quite commonly seen as hair ornaments. The third photograph we have of her is one that she wore in the locket. She appears to be much younger and certainly had a fine head of hair. I often think of her sitting at the dressing table in the bedroom that I knew so well, tossing her hair, gathering it up and then picking up the comb to insert it and arranging herself. I often think of her, just looking at it and perhaps smiling as it is such a lovely thing. I often think of her holding it, admiring it, cleaning it. And I wonder if her five young children ever hung around her, watching her doing her hair. So when would she have worn it – every day or for special occasions? Did she wear it when living with her sisters? Did she wear it when she was a housekeeper for her brother the priest in Glenties? Did she wear it on her wedding day? It’s impossible to tell from the photograph. When did she last wear it? She was quite ill for several years before she died. Would she have bothered with it then? Would she have worn it on days when she needed to feel good or to put up an appearance for her family who watched her suffering? Or did it lie abandoned in a drawer for the last years of her life? This is the only object we have in my family that our grandmother owned. It will be passed on to my daughter, her great-granddaughter in time. I would like to think that the great-great grandaughters she now has – Sophie, Isabella Freya, Lee, Mary Catherine, Mia, Freya, and Eliza Mae might in time be interested in seeing it too. It is particularly poignant to remember her today, on the 87th anniversary of her untimely death on 25 July 1931 at the age of 49. Her beautiful silver comb will keep her in family memory, hopefully for many years to come. 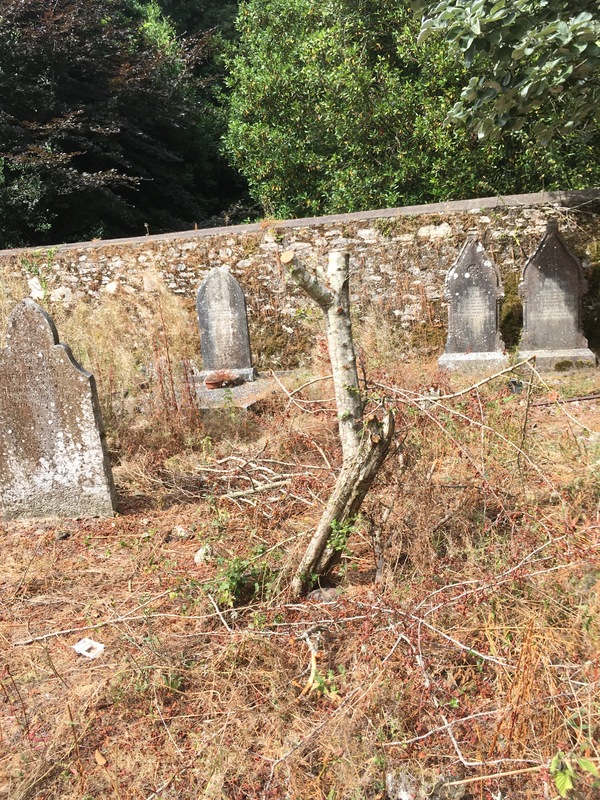 Summer in an Irish Country Churchyard – Parched or Burned? I am fortunate to live near a country churchyard on a bank of the tidal Owenacurra river, in Ballinacurra, Co Cork. This small graveyard contains the ruins of a church dated c. 1550, a watchman’s house and some historically interesting gravestones from the 19th and 20th century. In common with all older graveyards, ancestors rest here, flora and fauna thrive here in these special, largely undisturbed habitats. I thought it would be interesting to observe the four seasons in this very special place. My first post is here, – Spring, at the end of April last. It was now time to see what summer had to offer. Spring was cold and it was late. When it finally arrived, it produced lots of wildflowers there were lots of blossoms in the hedgerows. There is a particular concern this year that pollinating insects – and insects in general – seem to be scarce, but in recent weeks there have been wasps, bees, hoverflies, moths, and butterflies dropping in through open windows. So it was with a sense of anticipation I went down to record the magic of summertime in an Irish Country Graveyard. I was surprised to see that the stile at the entrance was covered by a pile of scrub – presumably to be removed at a later date?- and that it had been stripped of vegetation. Inside the gate, the groundcover plants have been obliterated. This has been a challenging summer with high temperatures and very little rain, resulting in a parched landscape. But the lack of vegetation here goes way beyond this. It is obvious that the area has been sprayed with a herbicide. There are no birds and no insects in this now barren place, no mosses or lichens and probably no invertebrates. Birds need insects and insects need vegetation, but there is precious little of it left. There seems to be a total lack of wildflowers, and therefore no pollen or nectar and instead of the bee-loud glade I expected, there is almost total silence. No humming of bees, no birds twittering on branches, only the sound of breaking grass under my feet. Greenery at ground level is gone. But what can have happened here? The sign inside the gate is clear. This site is protected under the National Monuments Act and no spraying of chemicals is allowed. 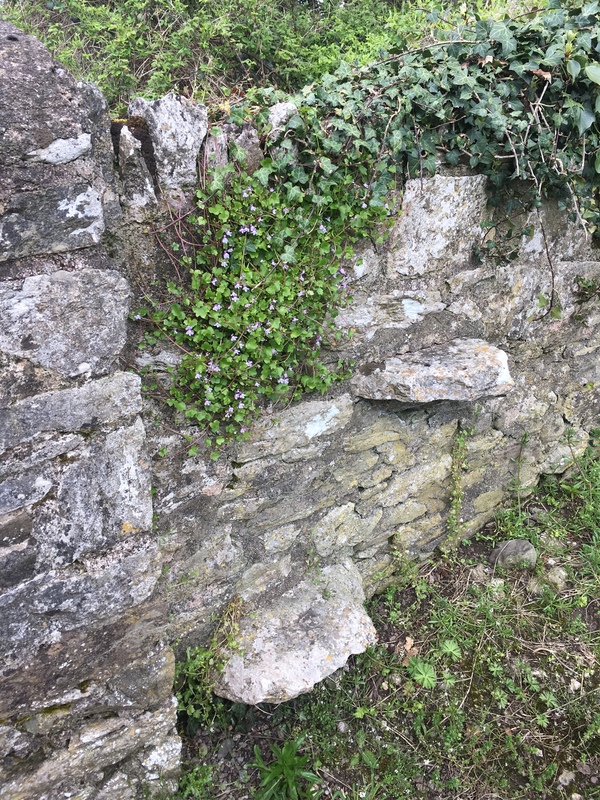 The regulations forbid the removal of vegetation from ancient stonework, as very often this very vegetation strengthens ancient walls. The watchhouse sprayed and ivy removed. The term ‘scorched earth’ just about describes what has taken place here. But why? By whom? Was it authorized by the Local Authority? This place is much loved and in constant use by local walkers and dog walkers who very often cross through the graveyard to reach the shore. Most of these people would be nature lovers who enjoy the uniqueness of the site. One walker yesterday described the work here as ‘total butchery’, another said it is a ‘terrible shame’ while another said that it was his understanding that there is to be a burial here in the coming days. Even if there is to be an internment, it is hardly good cause to destroy an entire ecology system? If the intention was to clean up the graveyard, this too has been a dismal failure as the place is strewn with bottles and cans . On the plus side, it appears that the walls of the 16th Century church have remained relatively intact – but the work is not yet finished so who knows what plan is in train with regard to these? 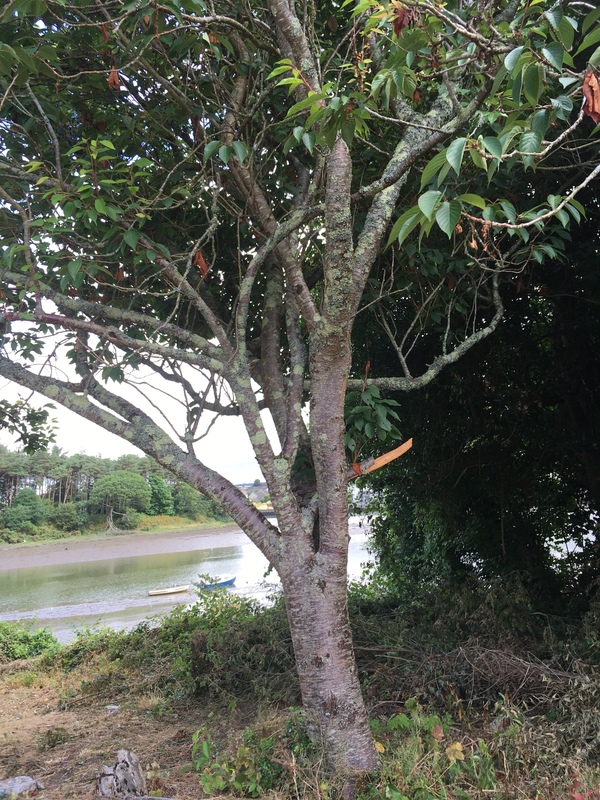 Small bushes have been cut and even a branch of a cherry tree seems to be in the way. A branch was in the way..of what ? 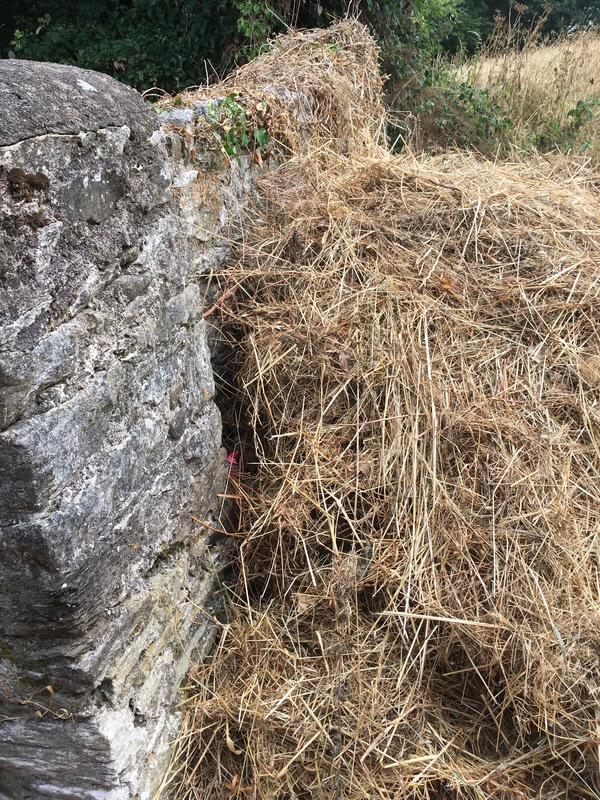 Great piles of bushes and scrub are now stacked up in various locations around the walls – what is to happen with them? I doubt that they will be removed, but rather left to decay where they are thrown. I do not have any expertise with regard to ancient buildings or gravestones or graveyard metal work, but I would have concerns that they are secondary to the need to remove groundcover. My limited expertise as a result of my career as a landscape designer leads me to the conclusion that a very powerful herbicide was used here and that it will take years for the soil and the site to recover from the loss of plants, wildflowers, invertebrates, lichens, mosses, insects, rodents, micro-organisms and birdlife. It appears to be too extensive to have been accidental or an unintended consequence. It is such a shame. Surely it is not impossible to clear up these special places and at the same time preserve the integrity of the flora and fauna that thrive here and give pleasure to so many? On this day, 13 July, 1911, a son was born to Hugh Coyle, car driver, in Milford, Co Donegal and his wife Mary. Hugh Coyle from Milford, and Mary McBride had married on 14 November 1902 in the parish chapel of Mevagh. Hugh’s father Patrick was deceased at that time, and Mary’s father, also named Hugh, was a farmer in Devlinreagh, Carrigart, County Donegal. In the 1911 census taken in April, we see that Hugh and Mary had four children – Ellen (Nellie) born in 1903, Bridget (Bridie) born in 1905, Patrick (Paddy) born in 1907 and Kathleen, born in 1910. Baby Hugh arrived in July and Anthony (Tony) arrived in 1916. Hugh Senior is invariably described as being a ‘Car man’ or ‘Jarvey’ on all official records. In the1901 census he was a car man in the service of Hugh McDevitt, hotel proprietor in Milford. I don’t know when the young Hugh Coyle came to Carrigart, but he did so at a relatively young age. The earliest photo I have of him was probably taken in the early 1930s. Our Uncle Séan Gallagher, Hugh Coyle and Uncle Jim Gallagher at the front. Hugh served as an apprentice shopworker at Mc Elhinneys shop in Milford. This very positive and glowing reference is dated 1937, which may well be when the then 25-year-old moved to work in Carrigart. In any event, we can tell from photographs that he was friendy with our family and he was to fall in love with and marry one of them! The next photo I have of him is with our father when both of them were in the Local Defence Force. This photo is dated 1940. The next photo I have is easily dated for it is the wedding photo of Hugh with our Aunt Eileen Gallagher in 1945. On the 19th of July 1946, their first child, Mary Patricia was born in Carrigart, just 6 days after her Dad’s 35th birthday. By this time Hugh was working in Derry as Mary Patricia’s birth certificate gives his address as 23 Orchard Street, Derry adjacent to the famous St Columb’s Hall, and beside the city walls. The joy of their new arrival was to be short lived as Mary Patricia survived but a few months. However they went on to have a son in the following year and a few years later a daughter was born. An undated photograph of Aunt Eileen and Hugh in the back yard of the family home in Carrigart. Our Uncle Jim Gallagher, Hugh Coyle, Uncle Séan Gallagher and friend Charlie Gallagher. Again undated. Hugh worked in Letterkenny for a time, in what I think was the Rainbow Bar, but they eventually emigrated to Glasgow and lived in the Pollokshaws Road. Every year, the Coyles came home to our house for the summer holidays and it was always great to see them. My abiding memory of Hugh is that he was a very gentle, quietly spoken and kind man. It often strikes me that even as a child I loved these qualities in him. In Glasgow, he was able to take a passionate interest in the Glasgow Celtic Football team which he loved. In 1970 they reached the final of the European Cup but they were defeated by a Dutch side which would have been a great disappointment. The following day on May 7,1970 on his way home from work, the gentle and kind Hugh died suddenly and tragically within feet of his own front door. He was only 58 years of age. I recently came across a few photos of Hugh that I had not seen before and as it is his birthday I thought it would make a nice tribute to put a few of them together. We remember him with love today and always. We were the better for having known him and it is an honour to have a page for him in our Family Story Book.